This is why I shouldn't be allowed to use Photoshop. 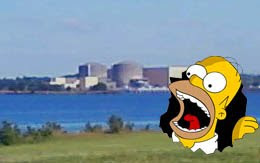 OK, so Homer Simpson wasn't really there, but I am very close to the McGuire Nuclear Station. I remember when I lived in Davidson they distributed potassium iodine pills to protect our thyroids in the case of a nuclear meltdown. For one thing, how about a pill to protect, you know, something useful? For another thing, I don't HAVE a thyroid, so the joke's on you, suckers! I don't even have a thyroid! Love it. I am really enjoy your blog. Very interesting insight.